The Mega Rig pirate ship matchbox building system starts as one big vessel and then becomes thirty different ships that you can combine any way you want. Recreate, launch cannons and harpoons. 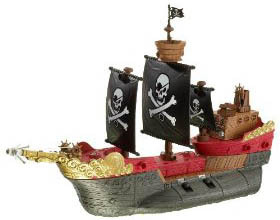 Accessories include a giant squid, two pirate figures, and a treasure chest. The pirate ship can actually float on water (think bathtub) and roll on land (think bedroom floor). Peer out from atop the sails, watch the bridge, and beware of boarding pirates. It's time to set sail on an adventure of the imagination.